So, you got yourself a ball and don’t know how to use exercise ball, except maybe for a footstool in your living room. An exercise ball can be intimidating, but not if you have these free exercise ball instructions. Make sure you are using the correct size of ball. - 55 cm for people who are under 5 feet 4 inches tall. - 65 cm for people who are 5 feet 5 inches to 5 feet 10 inches tall. - 75 cm for people who are taller than 5 feet 10 inches. See a free 5 minute exercise ball video from this page. Make sure your ball is properly inflated. Generally the exercise ball comes with a hand or foot pump. Inflate the ball until it is fairly firm which allows for more balance challenge. If the ball is a little soft or under-inflated it is easier to control. Place your feet about hip width apart and directly under your knees. Your legs should be bent at a 90 degree angle to the floor. You can do various balance exercises sitting on the ball in this position such as the hamstring stretch shown above, toe/heel rocks, bouncing up and down to strengthen your quads, spine stretches twisting and side bending, abdominal curls with your feet propped against a wall. All the exercises add to the challenge of balancing and improve your core strength. Many of the lying stability ball exercises are Pilates based and involve articulation of the spine or an added core challenge. Lying on your back with your feet on the ball you can perform pelvic lifts or bridges with leg curls to strengthen the hamstrings. 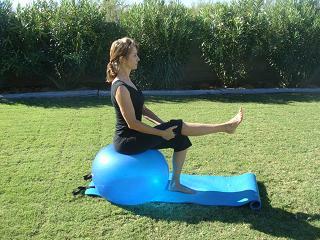 Try doing the Pilates hundreds or leg circles with one or both feet on the ball. You can roll and practice balancing while holding onto your ball. Lying prone or with your stomach on the ball really targets the core and back muscles. Lying with your pelvis supported on the ball, feet on the floor and hands on the floor under your shoulders try extending opposite arm and leg, then try some pushups with your legs elevated and parallel to the floor. If you are getting comfortable with your ball and want to find out more ways in how to use exercise ball then follow this link to get my full 40 minute Pilates Core Ball DVD available here.